Recently, a discussion of comics emerged in a thread about films. Obviously, it didn't belong there -- so I thought that a thread specifically about comics might be in order. 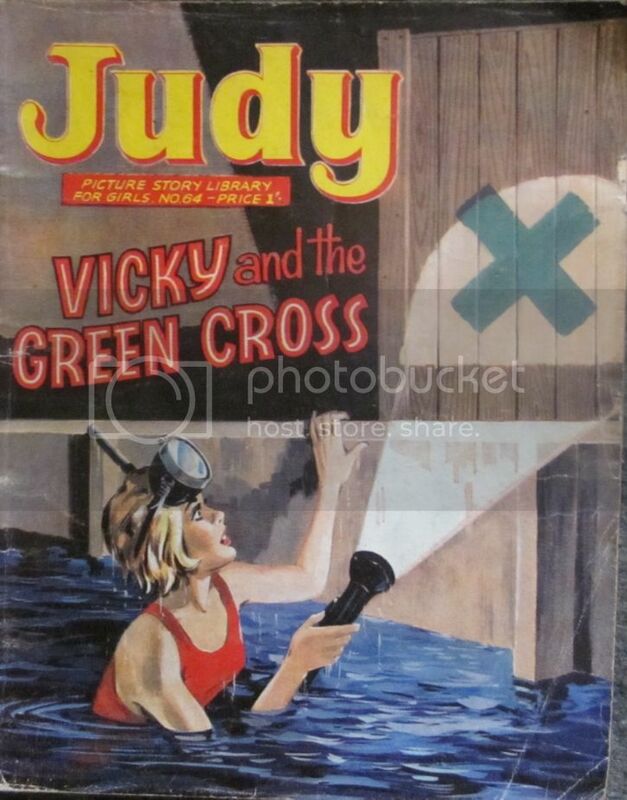 I start this thread with the cover of Judy Picture Library No. 64 (1968). I'm not enormously keen on Picture Library comics. The story had to fit exactly on to 64 small size pages. Stories either have major holes in the plot because they should have been longer, or contain padding because they should have been shorter. Not uncommonly (obviously created in a hurry) they have both major plot holes and padding. This example tends toward the plot holes. I include it here because the cover seems to me to encapsulate very neatly the whole genre of the girl detective. Is it possible to see this cover and not want to read the comic? ^ Totally reminds me of those old dusty yellow hardback Nancy Drew books I was obsessed with as a youngster. Hahaha...the Mystery At Lilac Inn, The Secret of Oak Lane Cottage and whatnot. I love my comics. Have since the late 80's. I was a DC kid and my brother was Marvel. I started with a couple different Batman titles and Justice League (International maybe? Then it was renamed Europe before going back to the International title? )...also Green Arrow and Black Canary. By the early 90's I was old enough to buy and appreciate The Sandman (Neil Gaiman became and still is my favorite author) and Batman: Legends Of The Dark Knight. The original Catwoman series that launched in '92 or '93 cemented my still raging (hard on for?) obsession with Ms Selina Kyle. I have issues #1 thru #50 something of that run (I may be gay but damn, the curves that Jim Balent's pencils created...mmm). And I just downloaded a whole collection of Clive Barker's mini series and ongoings. Great fun. I saw the comics discussion start over in the film thread and was so glad to see you started it's own thread Pet. I am an out and proud comic book geek! Yeah, I thought that maybe a few people on this board would like comics. Crumbs! On a much lighter note, here's the cover of the Tammy 1980 summer special. I like the way Tammy's hair bunches rise in fear... and how these resemble horns. Posted this in the films thread before I saw the new comics thread. 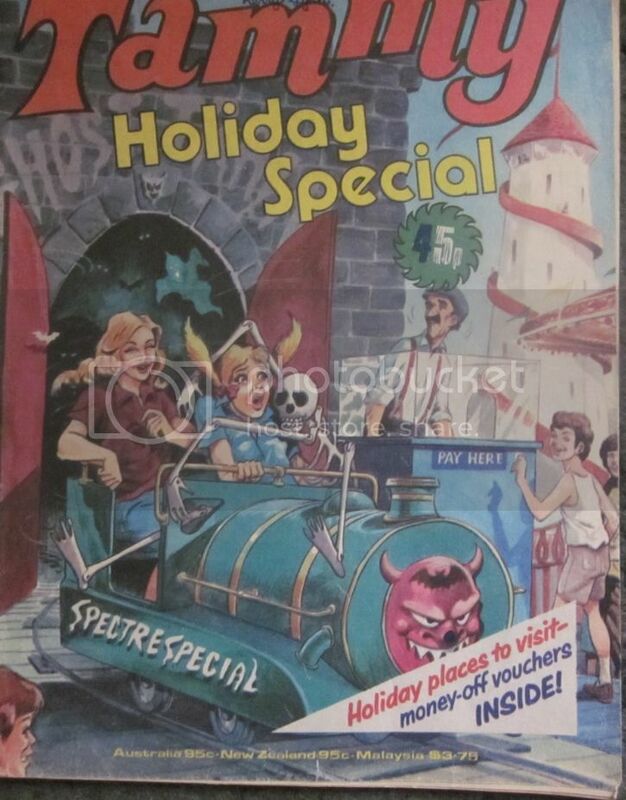 I also read Sparky, Topper, Beezer, and Dandy when I was very young but then moved onto the American comics as below. I have moved this from the film thread. Interesting stuff Pet. I love a comic collection. I use software from an American company called CLZ. Best I have used as it loads all the details from a database, including a thumbnail of the covers. I can download it to my phone and it is great when you are in a shop away from home and you are wondering if you have a certain issue. I also have their music database as well for records which is equally good stuff. I bought my first Batman comic when I was 6. A shilling ! In them days, they were not regularly imported into the UK and came across as ballast in the bottom of ships. They turned up periodically in the small newsagent across the road on a twirly stand and I was drawn to the bright colours of the costumes and the insight into a different world to mid 60's Britain. I was hooked! At first I collected any I could lay my hands on; Batman, Superman, Flash, Justice League of America, The Brave and The Bold etc, then in the 70's started picking up Marvel comics as well; Spider-Man, Iron Man, Fantastic Four; it was getting out of hand! Eventually, something had to give and I eventually weened myself off them all except Detective Comics and Batman (both Batman lines) and have been collecting them to date. I have about 410 of each of these; at least 300 or so of each in an unbroken run. They appear once a month, so 12 a year so off to your calculators and you can age UT roughly. The collection database software is good, reasonably cheap and they do one for comics, books, music, films, just about anything people collect. I think, oh most Urban of Tribesmen, that the software would be less useful to me than it is to you, as I have no mobile phone. So, when I found myself in a comic shop, I'd still need to rely on a hand written list in a notebook. My earliest memories of Batman belong more on the film thread than on the comics one. In the mid 1950s, I watched a Batman serial at Saturday morning pictures. It seemed very exciting, and I suggested to a friend, who also went to Saturday morning pictures at the Rayleigh Regal, that we should play Batman. My friend agreed enthusiastically, and then the game fell flat. Neither of us had any idea of what Batman was about, not even to the extent of realising that our game should be a variant of Cops and Robbers (which was, itself, a variant of the ever popular Cowboys and Indians). I saw a Young Marvelman annual when I was aged about thirteen. Apart from that, my first exposure to American superhero comics (or UK reprints thereof) was when I went to university in 1966. The fact that you, Urbane Tribesman, saw them aged 6 suggests to me that you're much younger than I am. The first comic I bought must have been the Beano, when I was aged about 8, and certainly cost a pre-decimal 2d. 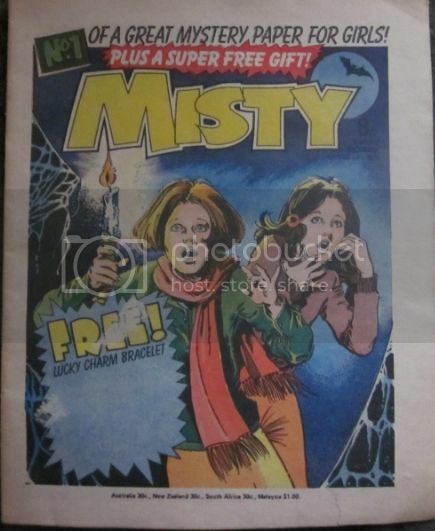 Here, costing me a lot more than 2d, and having cost the original owner 8p on 4th February 1978 (or soon after), is the cover of my copy of Misty issue 1. As is the case with almost all copies, the free gift is missing, but (unlike some copies) its removal didn't significantly damage the comic. It's actually a really nice copy of the comic with minimal discolouration of the paper. Not sure if that final 'e' on the last salutation was intended, or a slip on the keyboard, but I thank you for the compliment anyway. When I first adopted this moniker, I was indeed an Urban Tribesman. Now, having tired of living check and jowl with the great unwashed, I live in the country, so perhaps I should rebrand and become Rural Tribesman? I am younger than you, 'tis true. Not by much. You bought that first Beano before I was born, but not before my older Sister was. There is about the same difference between us as between Alison and her next Sister (+ a couple !). I remember the Beano. Dennis the Menace and Gnasher. The Bash Street Kids. Mini the Minx and Roger, the Dodger Those were the days when teachers wore gowns, even in the Bash Street School, and carried a cane. Sounds like my school experience ! DC Thomson have a pivotal place in British comic history and are behind so many old famous comic names. The Beano started in 1938 and is still going, as is DC Thomson. Who would have thought such a dour looking bunch of Scotsmen from Dundee would become pivotal in such rumbustious comic comedy ! Here they are, looking...well.. Dour! My favourite comic book artist is Neal Adams. 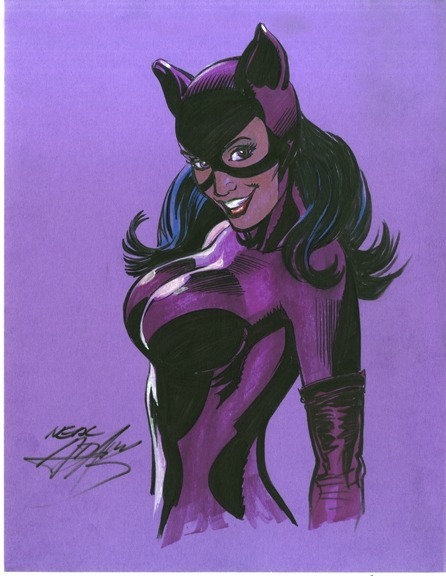 He spent a fantastic tenure in the late 60's/early 70's drawing Batman, including Selina Kyle AKA Catwoman. These are for you. Woof, woof ! This is interesting as well. The first image is some fan art of Batman and Catwoman giving in to those animal instincts, but the inspiration is clearly this earlier image by Neal Adams featuring the same pose with Batman, but, instead of Catwoman, we have Talia, the daughter of Ra's al Ghul, Batman's greatest nemesis. 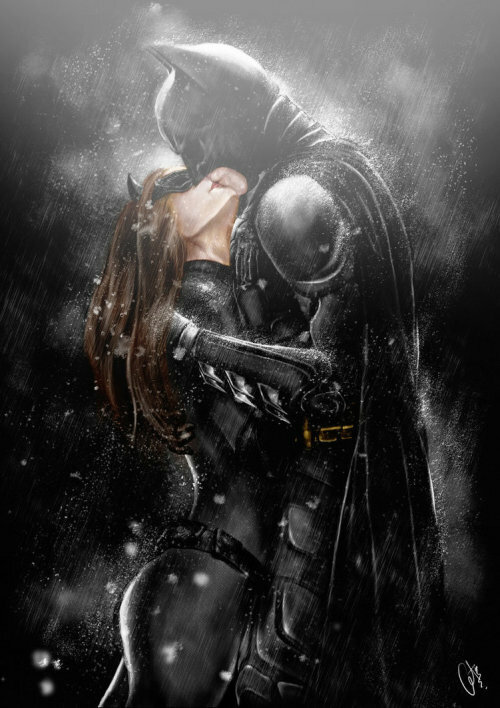 Batman has kissed a lot of woman though, as this link demonstrates. Interesting in the many different art styles this shows, each bringing a different aspect to the character. And, finally on the subject of Batman's love life, imagine these children ! A billionaire Princess with an invisible plane and a butler called Alfred ! Cat woman, eh? 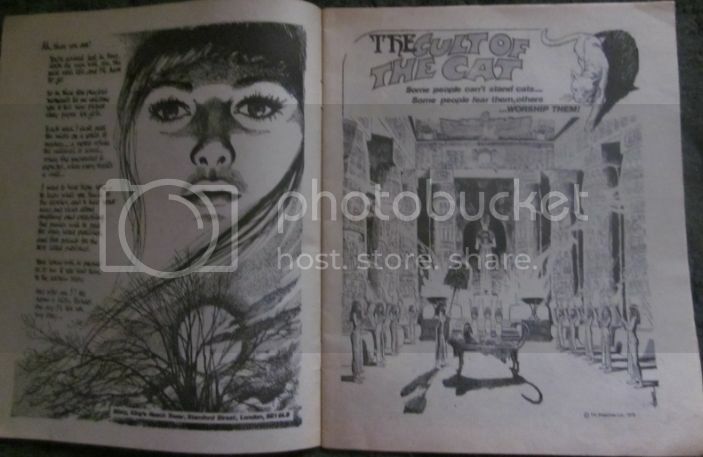 Here's the start of The Cult of the Cat (Misty issue 1, pages 2 and 3). Who would have thought such a dour looking bunch of Scotsmen from Dundee would become pivotal in such rumbustious comic comedy ! Here they are, looking...well.. Dour! Thank you for that fascinating picture. D C Thomson seems to be the most dapper and least dour looking of the Scottish quartet. Now we know the C stands for Couper. Is that Cooper or Cowper? I'm going for the former. A great general knowledge question, if it was not for the fact that most people would answer ' who the f**k are D C Thomson ! Re Urbane. With you as resident author, I assumed so. I try to be 'entertaining' (some would say pain in the arse). This is the oldest surviving comic I actually bought at the time. October 1966 ( England are football World Champions - so a very very long time ago). That's the date on the comic ( I know it says Nov but they are always dated in advance), but they took a long time to get to England in those days, so this is probably end of the year; maybe even early '67. I have earlier comics than that but these are ones I have bought since, not at the time. If you look carefully at the cover, it is 1s 9d. The comics were usually 1s but this was a 'giant' ( 80 pages) so cost more. 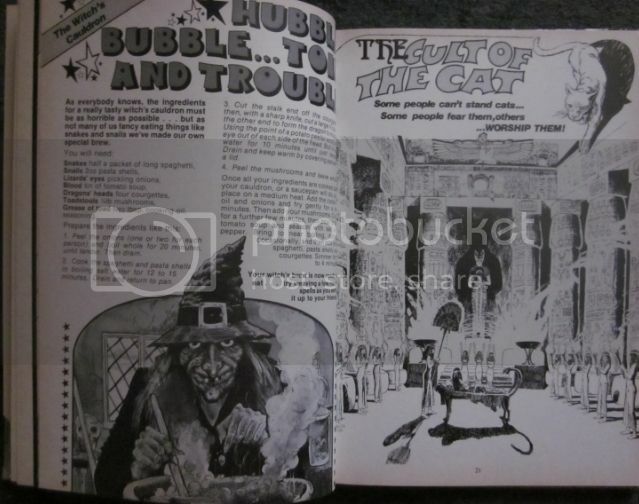 The most remarkable thing is that this was bought by me as a 7 year old and it managed to survive in pretty good order ( along with numerous others from that time) despite the kind of things a kid will do with a comic. I think I had quite a few others from this time, probably even earlier, but they were not so fortunate ! I did have a penchant for burning holes in things with a magnifying glass !